Generalmajor Erich Fronhöfer was an early member of the German Motorized Troops. After seeing detached motorized troop service in the late 1920s and early 1930s, he was appointed Adjutant of the Inspectorate of Motorized Troops and, later, Adjutant on Staff of the newly created Command of Panzer Troops. Both organizations were headed by General der Panzertruppe Oswald Lutz who, together with his highly talented Chief of Staff, Oberstleutnant (later Generaloberst) Heinz Guderian, helped create the operational art of modern armored warfare universally known as the “Blitzkrieg” (Lightning War). Influenced by leading British tank warfare theorists, both Lutz and Guderian developed the concept of grouping tanks into Armored (Panzer) Divisions. Guderian opined that tanks, teamed with motorized infantry and artillery, would operate as a “combined arms team” to deliver fast and decisive blows to an enemy’s flanks and rear as well as achieving decisive breakthroughs. Although these theories remained much at odds with the traditional military thinking of the day, Adolf Hitler believed in the concept and gave his support to the creation of the German Panzer Arm. Erich Fronhöfer remained in the nascent Panzer Arm throughout the 1930s seeing service as Commander of the Motorized Combat Troops-Demonstration Battalion, a unit that tested and evaluated new equipment and operational concepts. After several years of instructor duty at the Panzer Troop School, he finally received a field command—Panzer Regiment 10—which he led during Operation “Barbarossa,” the invasion of the Soviet Union on 22 June 1941. Putting his years of theoretical experience to use, Fronhöfer’s regiment led the advance of the 8th Panzer Division into the Baltic States and northern Russia. After a spectacular seizure of the road and rail bridges over the Dvina River, the 8th Panzer Division pierced the “Stalin Line” and advanced to the outskirts of Leningrad. 19 August 1914: Entered Army service as a War Volunteer in Füsilier-Regiment Königin Viktoria von Schweden (1. Pommersches) Nr. 34. 27 August 1914: Allocated to Reserve Infantry Regiment 210. 11 November 1914: Wounded/in hospital. 7 January 1915: Named a Fahnenjunker. 12 February 1915: Allocated to the Replacement Battalion of Fusilier Regiment 34. 18 February 1915-15 April 1915: Detached to the Fahnenjunker Training Course in Döberitz. 10 May 1915: In the field with Fusilier Regiment 34. 24 July 1915: Sick/in hospital. 23 December 1915: Company Officer in the 10th Company of Fusilier Regiment 34. 16 January 1916: Ordnance Officer on the staff of Fusilier Regiment 34. 21 March 1917: Company Officer in the 8th Company of Fusilier Regiment 34. 11 June 1917: Wounded/in hospital. 4 July 1917: Adjutant of the II. Battalion of Fusilier Regiment 34. 2 September 1918: Gas poisoning – allocated to Mortar Company 20. 11 December 1918: Transferred to the Replacement Battalion of Fusilier Regiment 34 and detached as the Demobilization Officer to the Stettin Garrison Command. 14 February 1919: Ordnance Officer on Staff of the Detachment Kraehe. 15 June 1919: Court Officer in the Krakow Transit Camp. 18 August 1919: Ordnance Officer on the staff of the III. Battalion of Reichswehr Infantry Regiment 3. 1 October 1920: Company Officer in Infantry Regiment 5. 15 January 1921-14 June 1921: Detached to Sport Courses in Dresden. 1 May 1924-15 August 1924: Detached to the Weapons School Course at the Troop Training Area Ohrdruf. 1 October 1926: Leader Assistant training with the staff of the 5th Division. 1 June 1927-31 July 1927: Detached to the 7th Motorized Battalion. 1 august 1927-29 September 1927: Detached to the 3rd Signals Battalion. 1 July 1928-31 July 1928: Detached to 5th Signals Battalion. 1 August 1928-25 September 1928: Detached to the 1st Motorized Battalion. 1 October 1928: Transferred to Infantry Regiment 5 and detached as an Ordnance Officer to the staff of the 5th Division. 1 November 1928: Transferred in unchanged service position to Cavalry Regiment 6. 1 December 1929: Detached to Motorized Battalion 2. 1 January 1930: Transferred to the 2nd Medical Battalion and Leader of the Unteroffizier [Non-Commissioned Officer] Candidates of the Motorized Troops in Elsgrund. 1 January 1932: Transferred in unchanged service position to Artillery Regiment 1. 1 April 1932: Transferred in unchanged service position to the 3rd Motorized Battalion. 1 April 1933: Company Chief in Motorized Battalion 3. 1 July 1934: Adjutant of the Inspectorate of Motorized Troops headed by Generalleutnant (General der Panzertruppe from 1 November 1935) Oswald Lutz. 15 October 1936: Adjutant on Staff of the Command of Panzer Troops headed by General der Panzertruppe Oswald Lutz. 21 September 1936: Detached to the Motorized Combat Troops-Demonstration Battalion. 6 October 1936: Commander of the Motorized Combat Troops-Demonstration Battalion. 12 October 1937: Leader of the Tactical Courses at the Panzer Troop School. 13 June 1940: Commander of Infantry Regiment 900 (Motorized) of the Demonstration Staff at Infantry School Döberitz. 25 February 1942: Führer Reserve in the Army High Command/in hospital. 11 May 1942: Commander of the Motorized Troops in Wehrkreis [Military District] XVII. 10 November 1942: Commander of the Officer Candidate Courses at the School for Motorized Troops in Zossen. 1 April 1943: Commander of the Fahnenjunker School of the Panzer Troops in Groß-Glienicke. 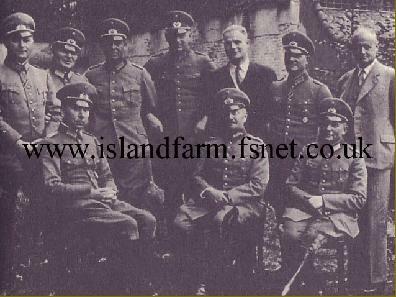 1 November 1943-24 November 1943: Delegated with the leadership of the static 20th Field Division (Luftwaffe) in Denmark. 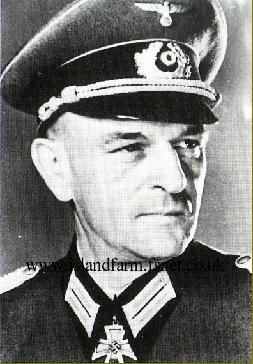 25 June 1944: Führer Reserve in the Army High Command. 14 July 1944-16 August 1944: Detached to the 12th Division Leader Course. 8 September 1944: Delegated with the deputy leadership of the 114th Jäger Division in Italy. 15 September 1944: Commander of the 20th Luftwaffe Assault Division in Italy. 1 April 1945-4 May 1945: Commander of the 547th Volksgrenadier Division on the Eastern Front. 4 May 1945-18 May 1948: Prisoner of war in British captivity. Knight’s Cross of the Iron Cross: 24 July 1941, Oberstleutnant, Commander of Panzer Regiment 10.